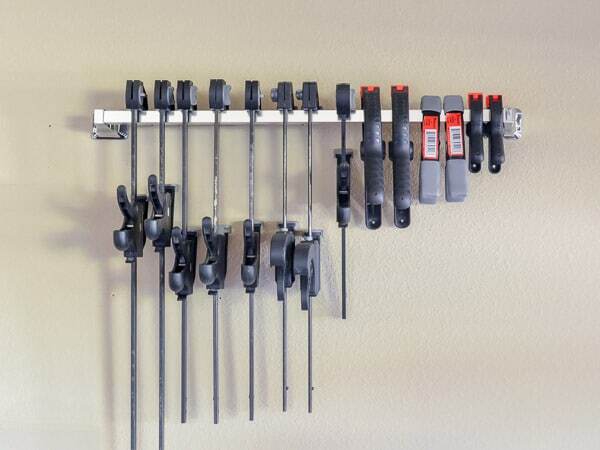 Anyone suffer from a messy garage? It makes me crazy when I’m trying to get something done, and I can’t find what I’m looking for. Thankfully, there’s no rule that says you have to spend an entire weekend getting everything organized at once. 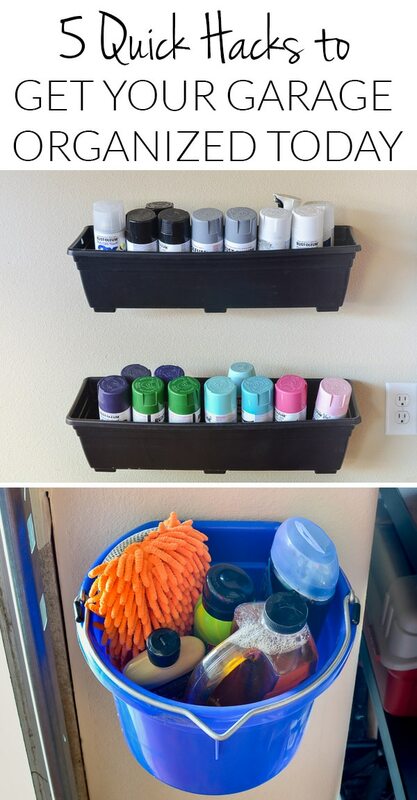 I came up with several garage organizing ideas that you can implement in just a few minutes each without a pricy storage system! First, grab a window box planter at the hardware store. Be sure it has a lip around the top for hanging. You’ll also want to pick up some Monkey Hooks if you don’t have any in your toolkit…or if you can’t find them because the garage is a mess. Next, mark a level, horizontal line on the wall the width of your planter. Insert a Monkey Hook about 3 inches from each end of the line, and one in the center for extra support. 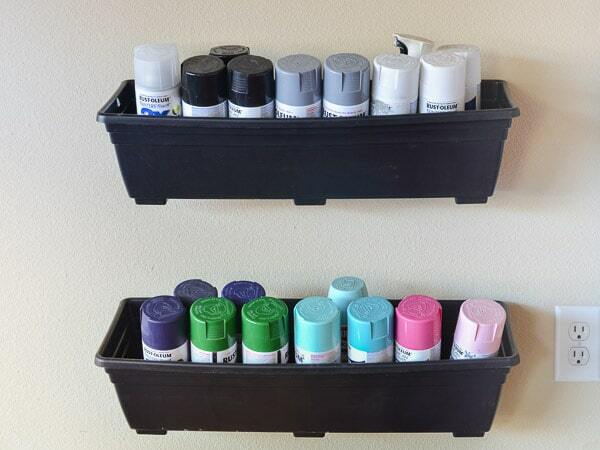 Hang your planter on the hooks and you’ll have an easy access place to store spray paint on the garage wall! PS: I had three planters full of spray paint and didn’t use the center hook. I overloaded one of the three and the actual planter tore on one side. The other two have been hanging almost a year with no issue, and I think the third would have been fine if I had used a hook in the middle for extra support. While you’ve got the Monkey Hooks handy, use 2 more of them to hang a flat back bucket. 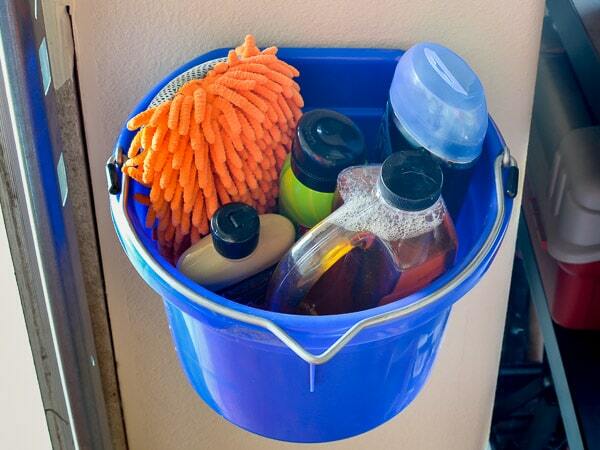 It makes a perfect wall mounted storage bin for all your car washing supplies. This one requires a screwdriver or drill, but it’s so worth it! 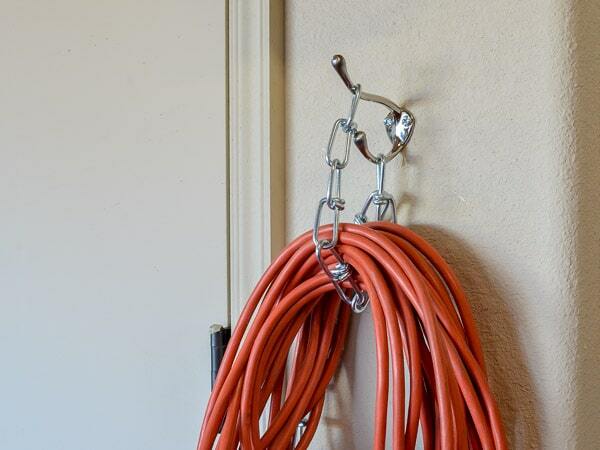 Add an inexpensive coat hook to your wall, and have a short piece of chain cut at the hardware store. We added two of the hooks, and each can hold two extension cords. Just make sure you use anchors or put the hook in a wall stud! It seems like we were always looking for the right size clamp for our projects, and a towel bar was the perfect solution to get them organized. Like the coat hook, it just takes a couple of screws and you’re all set! This one is more of a ONE MINUTE idea! 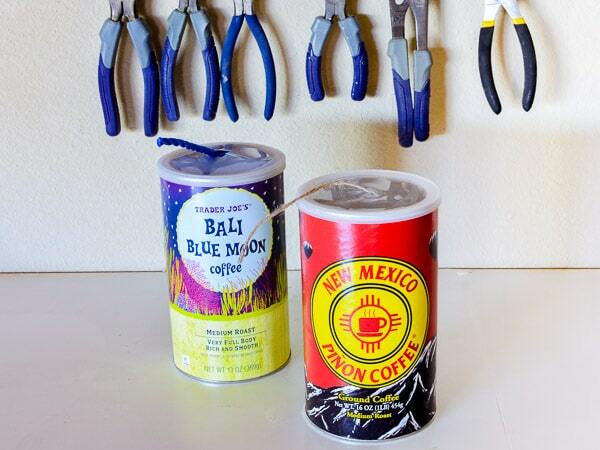 Twine and rope always gets tangled up when we store it in a bin, so now it lives in old coffee cans. I just cut an X-shaped slit in the lid to create an instant dispenser. 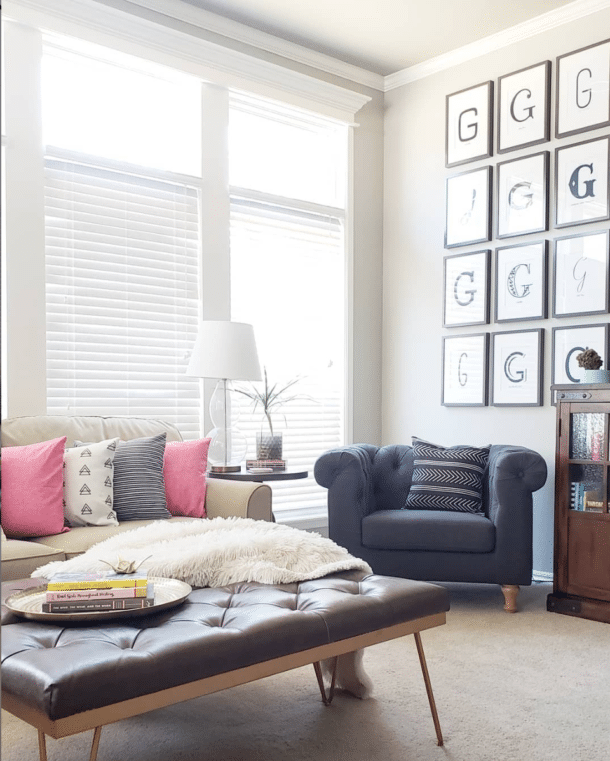 Isn’t it crazy what a difference you can make in your garage in just a few minutes? While more elaborate storage units are a huge help, you don’t have to make a large time or financial investment to start the process of cleaning up your dumping ground. Making some of these small changes is the perfect place to start if you’re overwhelmed. If you want to remember them for later, pin the image below! 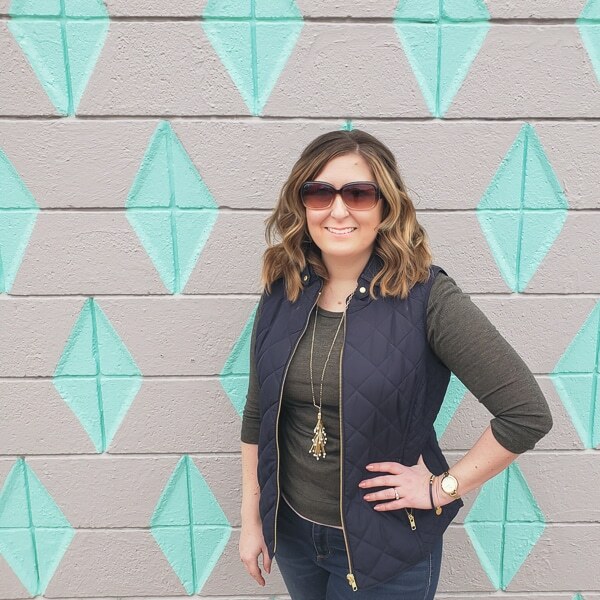 And if you haven’t seen our full garage makeover, check it out next! Thank you for this Melissa! 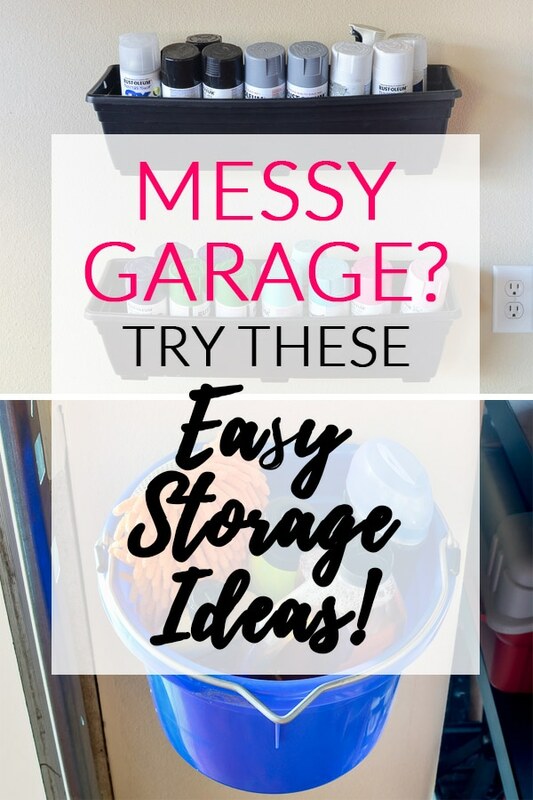 My garage is in desperate need of organization and these are SO simple to implement! ? What is a monkey hook ?